Back cover blurb: I know your name’s not really Jane Hughes . . . Jane Hughes has a loving partner, a job in an animal sanctuary and a tiny cottage in rural Wales. She’s happier than she’s ever been but her life is a lie. Jane Hughes does not really exist. Five years earlier Jane and her then best friends went on holiday but what should have been the trip of a lifetime rapidly descended into a nightmare that claimed the lives of two of the women. Jane has tried to put the past behind her but someone knows the truth about what happened. Someone who won’t stop until they’ve destroyed Jane and everything she loves . . . I've been looking forward to reading The Lie for what feels like an awfully long time. C.L. Taylor's The Accident was one of my favourite novels of last year. The Lie looks set to be one of my favourite I've read so far this year. The authors ability to keep you guessing right until the end is astonishing. Jane Hughes works in an animal sanctuary, a job she loves, an environment she feels safe in, until one day she recieves an anonymous note 'I know your name's not really Jane Hughes'. Jane is thrown back to a time she would rather forget, a time when she and five friends went on what was supposed to be the holiday of a lifetime to a remote retreat in Nepal; Ekanta Yatra. A time when she was known as Emma. A time when all they were interested in was getting drunk and helping their friend Al get over a particularly messy break-up. The holiday doesn't get off to the greatest start, it soon becomes clear that cheering Al up is going to be harder than Emma (Jane), Daisy or Leanne imagined. But Leanne and Daisy are determined to continue with the trip, Al and Emma less so. But on they trek (literally) to Ekanta Yatra. At first they all relieved to get there but Emma and Al soon become uncomfortable with some of the other retreat 'guests' behaviour and realise that all is not as it first appears. The two make preperations to leave, but unfortunately others are working against them. So much so, that they do finally make their move it ends in tragedy with only Al and Emma making it back to the UK. Emma reinvents herself as Jane, Al sells her story to the paper, a twisted, warped version of events according to Jane, and the pair do not speak for five years. The anonymous note that Jane recieves triggers her to try and get in contact with Al, and when she recieves a facebook message saying that Daisy isn't dead and instead it should be Jane/Emma that is dead, Jane begins to fear for her life. Are either Daisy or Leanne really dead? And if they are, just who exactly is after Jane/Emma? Some of its characters are thoroughly unlikeable but I guarantee the Lie will keep you hooked until the end. A thorough exploration of just how toxic female friendships can be. Dark, creepy, and full of suspense, it is definitely a must-read. 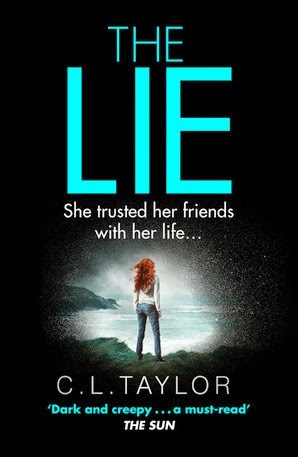 The Lie is available to pre-order now from Amazon online.